One of the most common questions we get asked here at The Alaska Sleep Clinic is "how can I travel with my CPAP machine?" Many of our patients travel frequently to the "lower 48" for vacations and to visit family, and quite a few of our residents have "slope" jobs which require them to be away from home for long periods of time between R&R breaks. Living with sleep apnea can be difficult enough without all of the extra hassles associated with travel. Many patients find having to use a CPAP machine every night at home challenging enough (at least initially), and the idea of having to travel with their machine almost too much to bear. However, you shouldn't let the idea of traveling with your machine get you down. And you definitely shouldn't leave your machine at home, even for short trips. What many people may not realize is that traveling with a CPAP machine is much easier than previously thought. 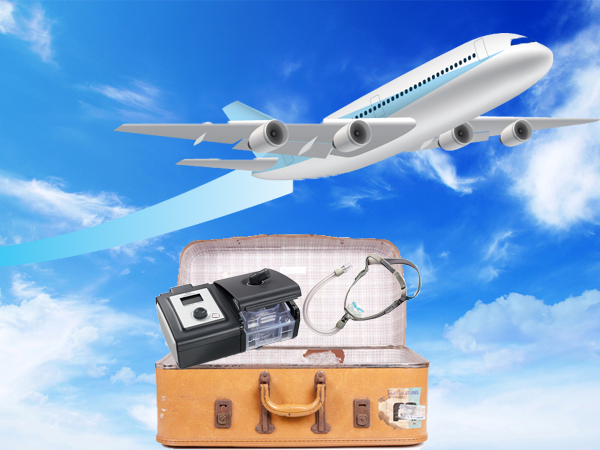 Here are some helpful tips for traveling with a CPAP machine. We're not saying that traveling with your CPAP machine takes weeks of extra planning or anything, but just make sure that you've checked off a few important things before traveling. A little planning ahead of time will make your travel arrangements all the easier and more enjoyable. 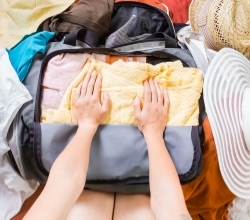 You can plan on packing your CPAP in your checked luggage if you wish, but many CPAP travelers prefer to bring theirs on the plane. CPAP machines are considered medical devices covered under the American's with Disabilities Act and do not count as one of your carry-on items. It's also a good idea to take your CPAP machine on the plane with you in case of lost luggage. Most newer machines are small, lightweight, and come standard with a carrying case so traveling with them shouldn't be a burden. However, there are travel specific CPAP machines that are even more convenient and easy to bring along. If you travel often, it may be worth the money to purchase a secondary, travel specific machine. Make sure you have all the proper adaptors and plugs for where you're traveling. International travel shouldn't be a problem as nearly all newer machines have universal power supplies that can adapt to various voltage. You may want to consider purchasing or renting a back-up battery pack. These are great if you plan on camping or simply as a precaution against power outages. Bring extra supplies (especially cushions). You never know when your mask cushions will fail. Before packing your CPAP machine, make sure the humidifier chamber is empty and dry to prevent spillage and potential damage to your machine. If you're flying overnight, or plan on sleeping during the flight and will be using your CPAP on the plane, check to make sure that your seat on the plane has power outlets. Keep your prescription handy just in case your machine breaks down or you end up needing additional supplies while away from home. Ask your current CPAP provider for recommendations on suppliers in the area you plan on traveling. Great providers may even ship you missing equipment or a loaner machine to help you through your trip. It is recommended to label your CPAP case with a medical equipment luggage tag. However, most TSA agents are more than familiar with CPAP machines, and will easily recognize them as medical equipment. You CPAP will need to be x-rayed. 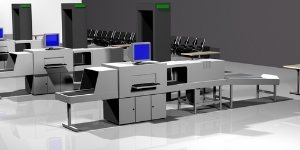 To expedite the process take the machine out of the carry case and place in an individual screening bin. The rest of the equipment can stay in the carry case.Your CPAP machine may need to be swabbed by an agent to check for explosives residue. If this is the case, you can ask that the agent use a fresh pair of gloves and an unused swab. If you're worried about sanitation, place the CPAP machine in a clear plastic bag before placing in the bin. It may be a good idea to keep your prescription for the machine on you in the event TSA agents need additional confirmation for your equipment. If you plan on using your machine on the plane make sure you have the necessary adapters or back-up battery pack. Fill your humidifier with bottled water rather than using tapwater in the airport bathroom or the bathroom on the plane. If you feel slightly embarrassed about using your device on the plane, you can always purchase a CPAP travel hoodie to be more inconspicuous. What if you want to take your CPAP machine camping? Just because you require using a CPAP every night at home doesn't mean you can't enjoy sleeping outside under the stars. The Transcend Travel CPAP machine is a favorite among patients at The Alaska Sleep Clinic for its lightweight design and portability. The Transcend Travel CPAP machine comes stock with not only a super lightweight, multi night battery, but also comes with a solar powered foldable charger so that you can charge your CPAP machine during the day for use at night. Check out the video below for more on the versatility of this incredible device. You shouldn't let travel get in the way of your therapy. Today it is just as almost as easy to travel with a CPAP machine as it is to travel without it. Don't leave your machine at home and allow yourself to suffer at nights. Whether you're traveling for business or pleasure, you want to be at your best, and you're not going to get there if you're losing sleep. If you're need ing any additional information on traveling with a CPAP machine, or would like to purchase a travel specific CPAP machine, feel free to contact the Alaska Sleep Clinic.